Edward Hollis studied architecture before working on Shri Lankan ruins and on old Scottish breweries. In The Secret Lives of Buildings, he charts the history of 13 buildings through time and multiple transformations, from the Parthenon and the Alhambra to the Berlin Wall and the theme parks of Las Vegas. Below, he explains why Wall-E is his filmic alter ego. In the future, movies will always begin in Manhattan. There will be an opening shot of the East River and the cloud-capped towers of Midtown. The cameras will do a wide, lazy pan, and then zoom into some crevice where somebody normal is doing something normal. It’s always the same. Give it a few minutes, and it won’t be normal any more. King Kong will be battling biplanes on top of the Empire State, Godzilla will have surfaced from the deep, and the day after tomorrow, a tsunami will be followed by a great freeze. Thousands of years in the future, a robot boy will sit buried under the ice, staring at a fairground attraction. I don’t want to be a blonde starlet caught in the arms of a gorilla (not this time), nor a dinosaur, nor an artificial child, but I do want to live in that future Manhattan of disasters and miracles; and when I’m there, my movie will start exactly the same way as all the others: the river, the towers, the pan, the zoom – and little old me, scurrying along the sidewalk, being normal. Except in the future life of my alter ego, nothing is normal, and I’m not in Manhattan. Rather, I live in a gigantic simulacrum of that long-lost city, a simulacrum I have painstakingly constructed myself. The river is a river of dust, and I have built the great towers out of little cubes of compacted rubbish, the detritus of the original Manhattan. I am a menial robot. Every day I scavenge for rubbish, and occasionally I find a treasure or two. In the evening I drag them back to an abandoned shipping container, and in my cabinet of abandoned curiosities, I rest until morning. I do not sleep. Instead, I spend the night watching my only film: it’s a story set in a vibrant, vanished, New York. ‘Put on your Sunday best,’ sings Dolly, in the guise of Barbra Streisand. My alter ego, Wall-E, like the junk market at the beginning of Star Wars, the City of the Dead in Barbarella, and the leaking Frank Lloyd Wright houses in Blade Runner, reminds us that in the future, cities won’t be futuristic. They will be quite as messy as those of the past. Indeed, they will be made out of their broken remains, as they have always been. At the end of the film, the returning human race turn the robot’s trash Manhattan into an Eden, then a garden, then a farm, then a village, a town, and a great city once again. Their efforts are represented in paintings that develop from cave painting to abstraction via every style in between. 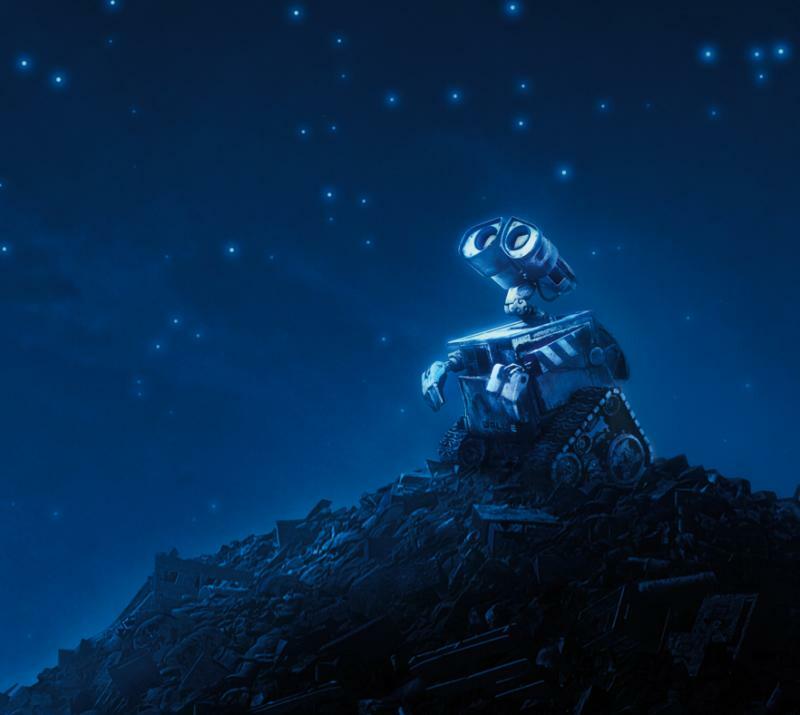 In each of them appears Wall-E, the robot rubbish collector, more mythic with every redepiction. Perhaps it’s all happened before. Cities abandoned in jungles and deserts were futuristic once. That we have outlived them is a tribute to the toiling midgets who inhabited their ruins. In the future I want to be a scavenging robot, the sentimental fan of Hello Dolly, upon whose drudgery will be constructed an entire civilisation. The Secret Lives of Buildings by Edward Hollis is published by Portobello Books.